The Australian grass parakeets, as their often called. red; narrow blue band on nape; back and wing-coverts green; shoulder feathers bright pale green; rump and upper tail-coverts ultramarine blue; under tail-coverts greenish-black with broad red margin; central tail feathers black, the outer feathers greenish-black; upper mandible red with black tip, lower mandible black; iris yellow; feet grey. Female with green head and breast; pale shoulder feathers absent; bill brown. Immatures as adult female; young females have less red on lower breast and abdomen; bill yellowish; iris dark. Parakeet Sizes:Parakeets are small to medium sized parrots. They vary in size from about 7" up to 18" (18-45 cm) in length. Parakeet Colors: Parakeets are very colorful birds. The exact color range is dependent on the types of parakeets but their feathers can be brilliant. Colors range from lush greens to brilliant yellow, reds and oranges, blues and more. Parakeet Shapes:The word "Parakeet" means long tail, these birds generally have slender bodies and long, tapered tail feathers. They have a hooked upper bill that they use to climb, hold things, or to dig. They also use their beak to chew, break seeds, and peel fruit. Parakeet Songs:Parakeets are fairly intelligent birds. Each species has its own set of calls with some birds being quite adept at mimicking sounds they hear. Some will repeat words, phrases and even whistle. Life Span:Pet parakeets are known to live longer than parakeets in the wild. The average life span of parakeets is unknown on most species. But the question, how long do parakeets live, can be answered with some generalities. Formulated Diet:A formulated diet provides a good nutritional base so does not require the addition of vitamins, however it does not contain the phytonutrients (antioxidant pigments) that are found in vegetables, fruits, grains, and seeds. Seed Diet:A seed only diet offers much more variety but requires additional vitamin and calcium supplements. Parakeets need not only nutritional requirements met but also variety for psychological enrichment. Small ParakeetsThere are parakeet seed mixes for birds the size of a budgerigar. A single small parakeet will eat about two tablespoons of seed a day and a half a cup of fruits and vegetables. Fruits and Veggetables:Some of the supplemental fruits include apples, grapes, bananas, pears, cherries, mangos, oranges, papaya, melons, peaches, and berries. Many garden vegetables that are good include spinach, watercress, field lettuce, poppy, chickweed, dandelions, carrots, corn on the cob, peas, zucchini, green peppers, endive, and sweet potatoes. 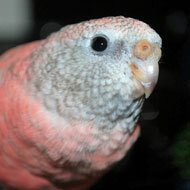 Proteins:Additional proteins can be offered on rare occasions and definitely when your parakeets are brooding. Some proteins are cottage cheese, hard boiled eggs, peanuts, monkey chow, and even dog food. Vitamins:Vitamins can be added to the drinking water or the food about 2 or 3 times a week, offer sparingly or not at all if they are being offered a wide range of other supplements. Foods to Avoid:Do not feed avocado as it can be toxic to birds. Other foods that are indigestible to birds are raw and green potatoes, all the cabbage family, grapefruit, lemons, plumbs, rhubarb, and dried fruits that have been treated with sulphur dioxide. Minerals:A cuttlebone or mineral block is important for their beak. Bird sand or gravel and oyster shell provides important minerals and can be offered in a separate dish. Wings:The wings should be kept trim if you want to discourage flight and to prevent the loss of your pet through an open window or door. Beak:The beak needs to be trimmed if it becomes overgrown or deformed. There are many mineral blocks, lava blocks, and other beak grooming items available at your pet store to help your bird keep it's beak in shape. Nails:A variety of concrete type perches are also available to help keep the nails trim, but they should be trimmed if they become overgrown. Bird nail trimmers and styptic powder to stop the bleeding are also available at pet shops and online. Small Parakeet Cages:A cage for a pair of small parakeets should be at least 39"x20"x32" (100x50x80 cm). Medium and Large Parakeet Cages:A cage for a pair of medium parakeets should be at least 59"x32"x59" (150x80x150 cm) and bigger still for the larger species. Indoor Aviaries:An indoor aviary is a cage set up in a room. A good size for two small pairs is 47"x32"x67" (120x80x170 cm). When estimating the amount of room they need to fly figure about 21 square feet per bird, with more space for larger birds or flocks. Outdoor Aviaries:An outdoor or breeding aviary needs to have a protected shelter that can be heated and cooled where necessary. The aviary will need plenty of perches or branches. Plants:Plants are both attractive and functional, but beware of poisonous plants as well as plants with spines or thorns. Some poisonous plants and woods include: laburnum, acacia, rhododendron, boxwood, buckthorn, cherry, horse chestnut, privet and oleander. Maintenance:The basic cage care includes daily cleaning of the water and food dishes. Weekly you should wash all the perches and dirty toys, and the floor should be washed about every other week. A total hosing down and disinfecting of an aviary should be done yearly, replacing anything that needs to be freshened, such as old dishes, toys and perches. Parakeet Illness Symptoms:Parakeet illness symptoms to be aware of are ruffled plumage, resting often with their head tucked under their wing or rump, not eating, discharge from the nostrils or mouth, cloudy eyes, loose watery droppings, weight loss (chest bone starts sticking out), large water intake, labored breathing, opening and closing it's mouth, listlessness, perhaps sitting on the bottom of the cage, stops talking, and growths around the beak. Parakeet Health Problems:Some of the common parakeet health problems your pet could contract are Aspergillosis - respiratory infection, Candidiasis, cold and sinus inflammations, diarrhea, egg binding, egg pecking, eye infections, feather plucking, frostbite, goiter or thyroid gland enlargement, mites, Pacheco's Disease, parrot fever also known as psittacosis, Salmonella, worms. Parakeet Behavior Problems:Problems in parakeet behavior usually stem from something missing in the bird's environment. Boredom, lack of trust, lack of interaction with other birds or people can lead to problems like biting, feather plucking, and screaming. Try to develop a bond of trust and spend time with your bird to help avoid these problems.